2019 marks the “Year of the Pig”, a year characterized by energy and enthusiasm. So what better night to cheer on your Giants as they play the San Diego Padres? Come enjoy pre-game performances and special in-game entertainment as we celebrate the Bay Area’s rich Chinese Heritage. 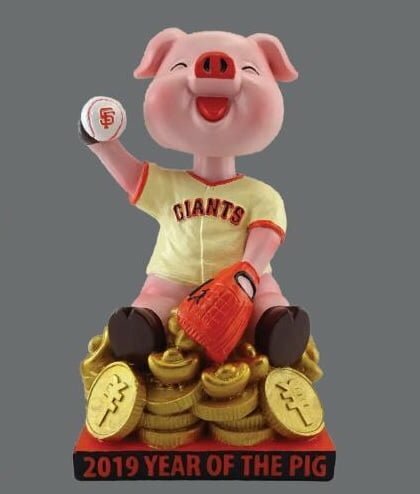 Your Special Event ticket includes a ticket to the game, as well as a collector’s edition Giants-themed “Year of the Pig” bobblehead, the ninth in a planned series of events celebrating the Chinese Zodiac. Partial ticket proceeds will benefit local Chinese-based charities. Don’t miss your opportunity to celebrate Chinese Heritage Night at the ballpark while also supporting a great cause!